Cassidy came into rescue too thin, and showing all the signs of being road weary from too . After some groceries and TLC from his foster family he has made huge improvements and has come so far! 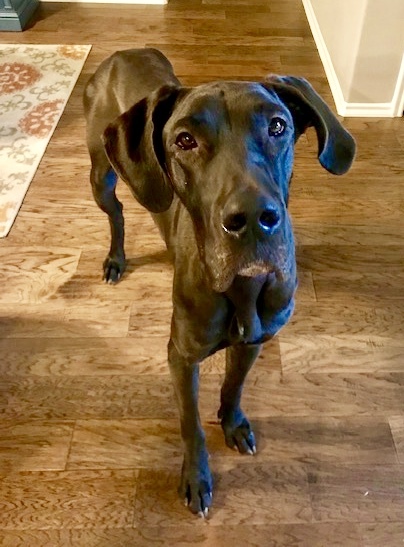 Cassidy has gained so much confidence and has found the perfect FURever home to keep up with his training and continue to build his confidence. Cassidy has his own skin sister who adores him, a fur sister who likes to play and. a family who loves him. Cassidy came to GDRNT via a rural shelter after being caught running loose for some time. Under the care of our awesome veterinarians he has sadly gained weight so he could take his no puppy pledge. He quickly learned about potty training, the comforts of a crate, a soft bed, full belly and that humans can be wonderful! Cassidy has found the perfect forever home! Congrats to him and his amazing family.